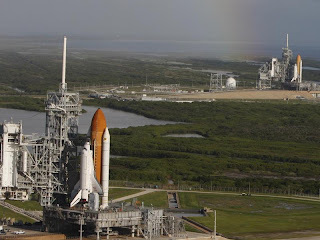 The above scene is one you'll never see again: two space shuttles on the launch pad, ready to launch. The closer shuttle is Atlantis, which is scheduled to launch on October 10 on the final mission to upgrade and repair the Hubble Space Telescope. The background shuttle is Endeavour, which is being readied to be able to launch on an emergency rescue mission, should it be needed. (If Atlantis is damaged during launch, like Columbia was, Endeavour will launch to pick up the astronauts and bring them home.) If it is not needed, Endeavour will move to the other launch pad and prepare to launch on a mission to the space station. These days, it's easy to forget how much of a failure Hubble seemed to be when it was first launched. Because of its mis-shapen primary mirror, it was no better than a ground-based telescope, and at several times the price! But, thanks to astronauts, engineers, and the foresight to make Hubble easily repairable, Hubble has become one of the most successful astronomical instruments ever. And, if this mission succeeds, Hubble should be able to operate for at least another 5 years, perhaps much longer! We all owe the astronauts from all of the Hubble missions a giant debt of gratitude. And, speaking of the possibility of astronaut rescues, anyone ever remember seeing drawings of the astronaut rescue ball? When I was a kid and just getting interested in space (the space shuttle program was just starting then), I remember seeing drawings of this thing (usually with some sort of orangish-pink coloring) everywhere. It's probably a good thing that this particular idea was dropped.